Or perhaps you’re an athlete who is not entered to participate due to injury or other reason – here’s an excellent opportunity to help your fellow athletes and socialize with them afterwards in a beautiful park setting. 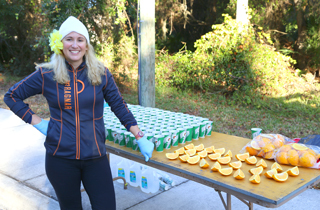 In an effort to give back to our community, we invite small non-profit groups to adopt an aid station during each of our races. Any non-profit group of eight volunteers will receive a post-race donation of $200. This is a fun way for running clubs, youth athletic teams, school groups, and other charities to participate in our community events while earning funds for your organization. If your group would like to participate, please register by clicking one of the buttons above. This is offered on a first-come basis and openings may fill up quickly. Please note that registering does not guarantee you a spot. Our volunteer coordinator will be in touch with your group assignment.